Here is a fun project I made inspired by a post on Pinterest. 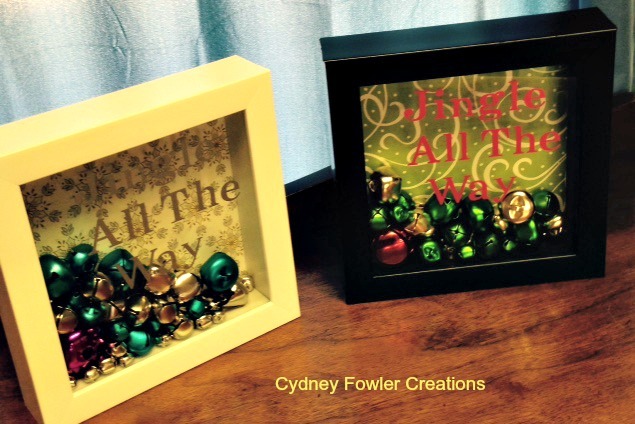 I made two versions of the Jingle All The Way shadow box. The paper inside is from Anna Griffin’s 6×6 paper pads I purchased on HSN. I know, I know – it is not Close to my Heart – but I love Anna Griffin products too and the 6×6 papers were just the right size for the project. I bought assorted jingle bells online and the 6×6 shadow boxes on sale at Michaels. The vinyl is Cricut brand vinyl that I cut on my Cricut Explore. I don’t “cheat” on CTMH very often, but I do make an exception once in a while, LOL. I set a 5″ square canvas up in Design Space and added a text box where I typed Jingle All The Way. I used the vinyl setting on the Explore and it does a perfect kiss cut. I pulled the square away from the backing leaving just the letters. I used clear contact paper as a carrier sheet to apply the saying to the glass on the front of the shadow box frame’s glass. It is a little hard to see, but one is silver vinyl and the other is red. I just saw another Pinterest post using the same idea but it said Let It Snow and had white Styrofoam pellets in place of the bells. So cute! Give it a try.